The visit to Moosehead Kitchen-Bar last year was so memorable that it was on my recommendation list whenever my friends asked me where to eat. When I was told that I am going back to check out the new menu, I was eagerly looking forward another mind blowing dining experience as well as meeting Glen Ballis, the chef partner, culinary consultant as well as the father of Daniel Ballis (father-and son partnership) who is in town. Dinner at Moosehead Kitchen-Bar started with the Meze Board ($19). 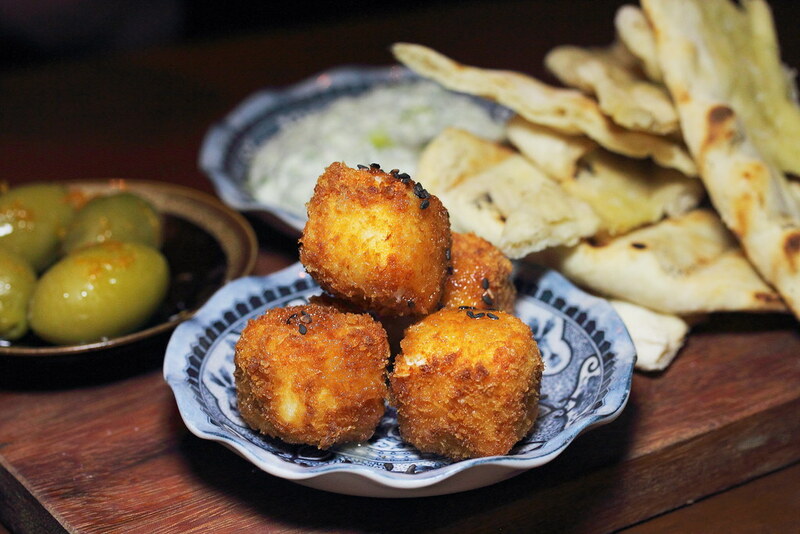 On the board is marinated olives with orange zest, crunchy feta with raw honey and black sesame and tzatziki with warm bread. Among the trio, my favourite is the tzatziki made from a mixture of greek yoghurt, garlic, cucumber, mint and parsley. The refreshing tzatziki dip goes very well with the warm bread. So good that I can't stop going back for more. 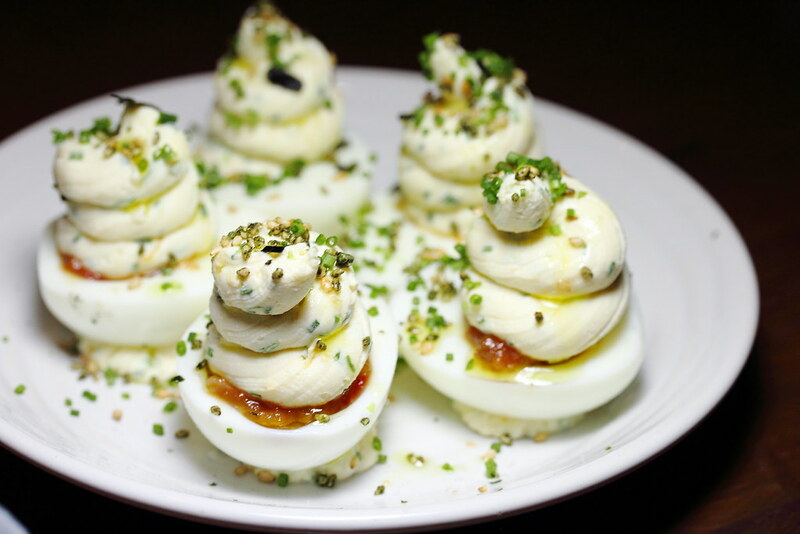 A special edition only for the Easter weekend is the Deviled Egg ($8). I thought it has a nice Christmas feel with the ricotta filling, tomato chutney and chives. 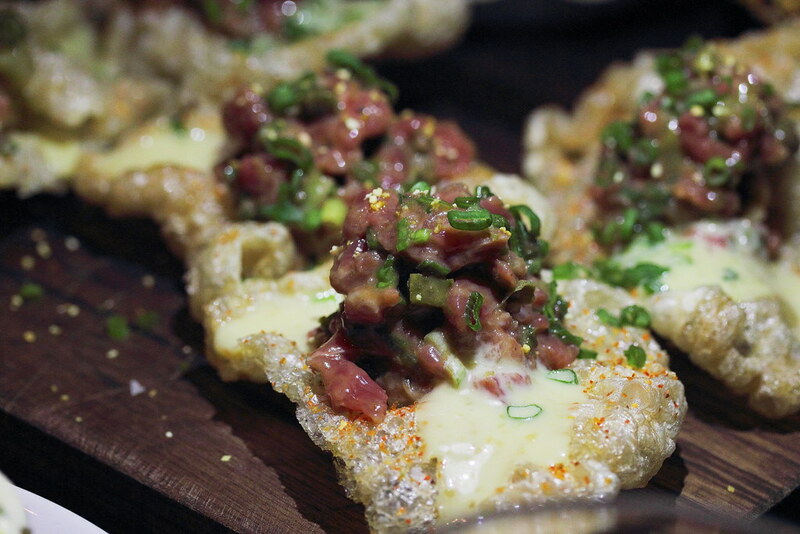 Last year I had the crispy spiced pork ears, this year Moosehead has up its game with the Pork Scratchings with Beef Tartare ($6/pc) dressed with yuzu mayo. The hand cut beef is in Dijon mustard, gherkin, capers, tabasco, ketchup, olive oil, salt, pepper and topped with Japanese chilli spice and spring onion. It may sounds like two individual components but surprisingly both of them married well together. 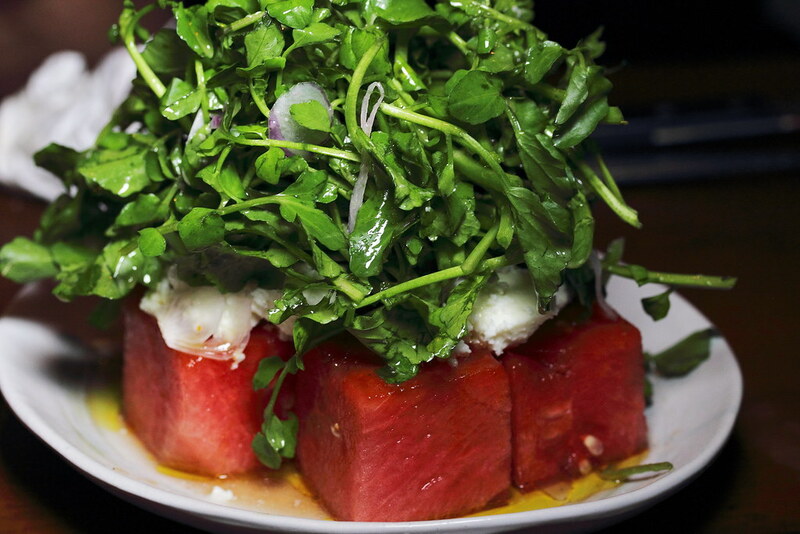 A very colourful and refreshing is the Seared Watermelon with Feta and Watercress ($12). The watermelon is flash pan seared with olive oil and salt to lock in the sweetness. The used of Chinese watercress further cement the chef's well travelled culinary knowledge and the used of locally sourced ingredients from Tekka market. A interesting some what fruit salad dish is the Avocado, roast pear, caramelized fig, goat cheese and spinach leaves ($16). 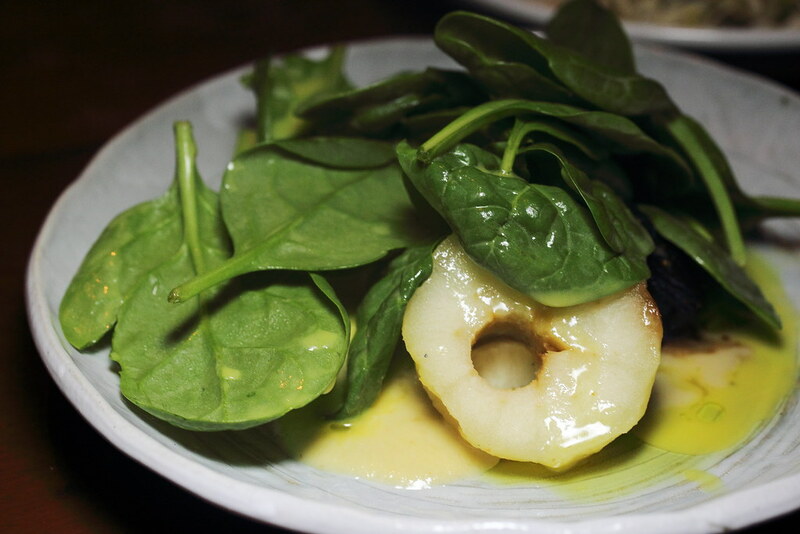 For me the star is the sweet lemon dressing that gel the whole dish together. 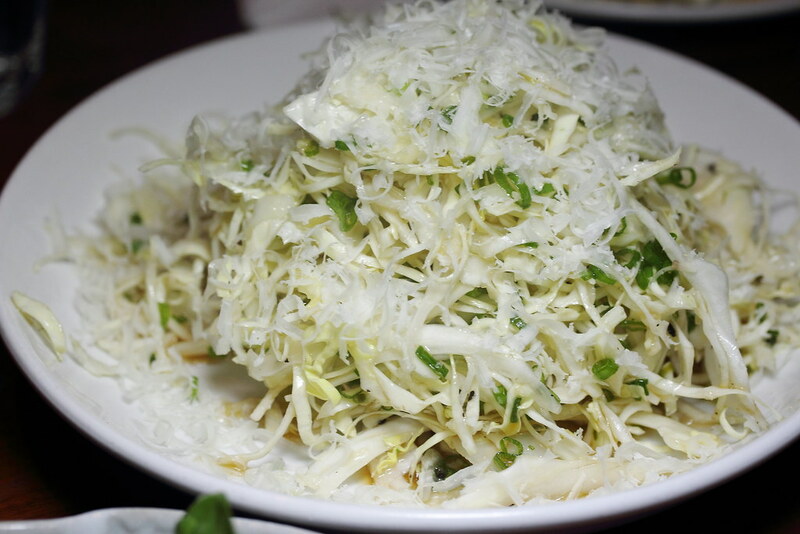 It is amazing how such a simple Shredded Cabbage ($8) can be so flavourful, simply using ponzu, percorino cheese and truffle to elevated the whole dimension of the dish. 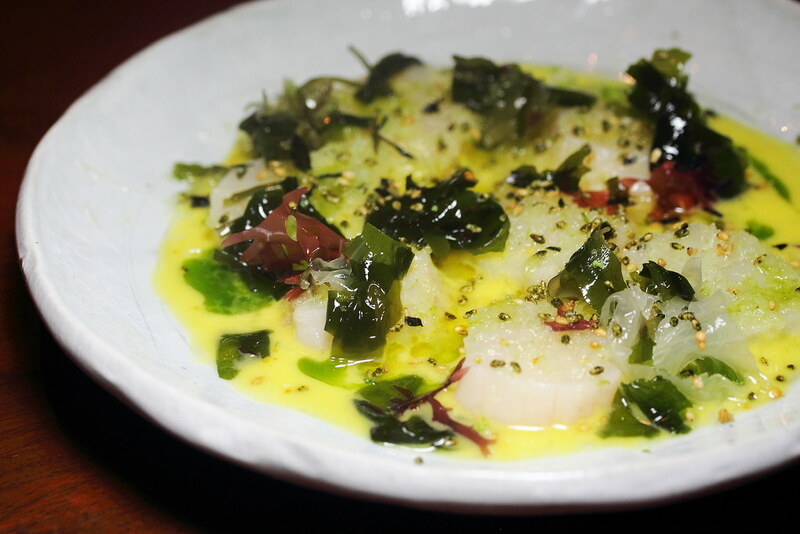 Packed with rich flavour is the Marinated Scallops, Orange Emulsion, Seaweed, Frozen Apple ($19). The scallops is marinated in yuzu, mizkan, mirin and red onions. The scallop swimming in a pool of delicious gravy of orange emulsion, shaved frozen apple, red and green seaweed. 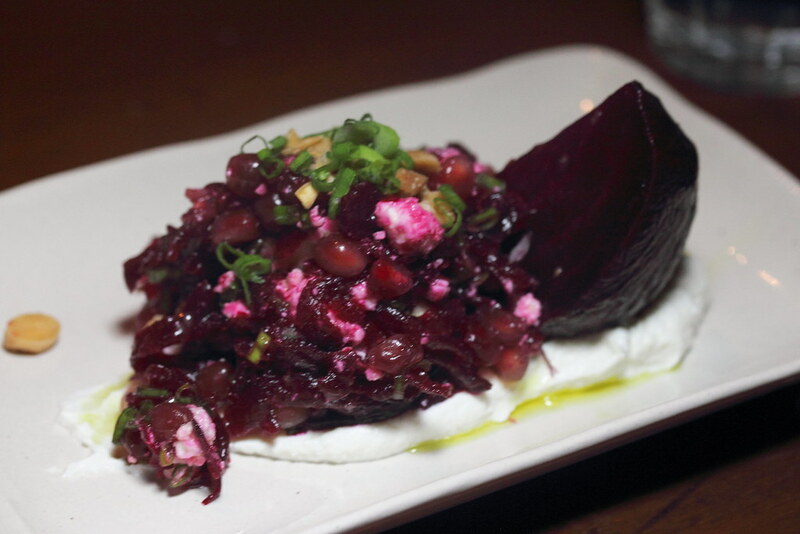 Another very creativity dish on the new menu is the Roast beetroot, pomegranate, toasted almonds, ricotta ($12). I could never imagine how smartly the chef has once again used the simplest ingredients and made it into a beautiful dish. You just got to try to understand what exactly I meant. Yet another unique pairing of Roast Carrots, Apricot Puree, Persimmon, Pistachio ($14). 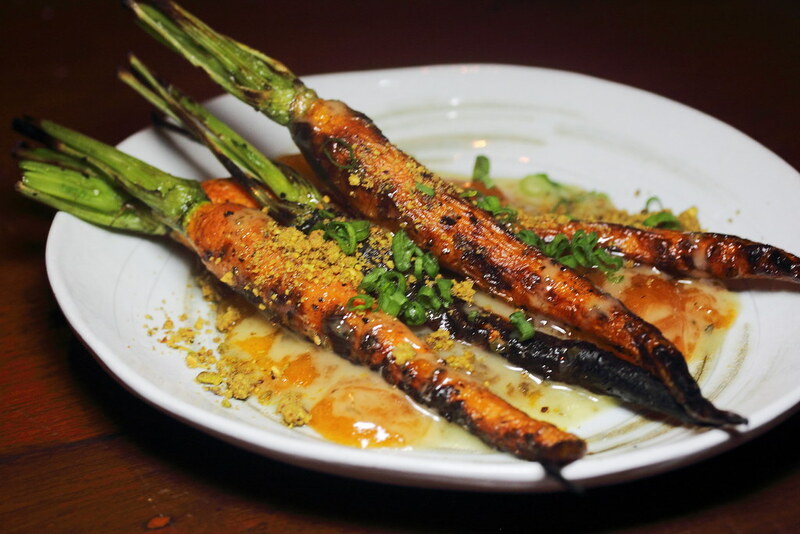 The carrots freshly brought from the market is blanched in salted water, rolled in olive oil and salt before being charred in charcoal oven.The main ingredient is then further accompanied with apricot puree, permission, crushed pistachio, rosemary and honey mustard dressing. Eating vegetable is never the same again with all these different components working harmoniously together. 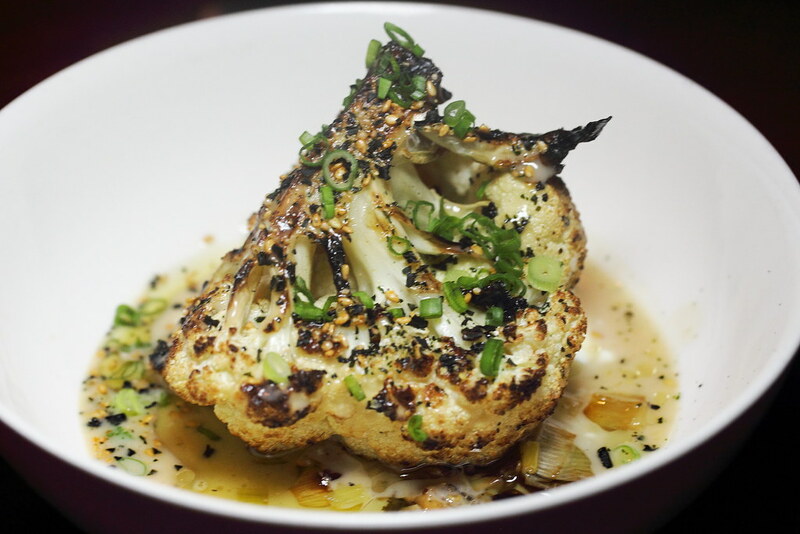 The smoky Roasted Cauliflower with Garlic Miso, Leek Confit, Creme Fraiche ($14) is another creation that demonstrates the culinary smartness of the chefs in using simple ingredients and elevating it to a whole new level. 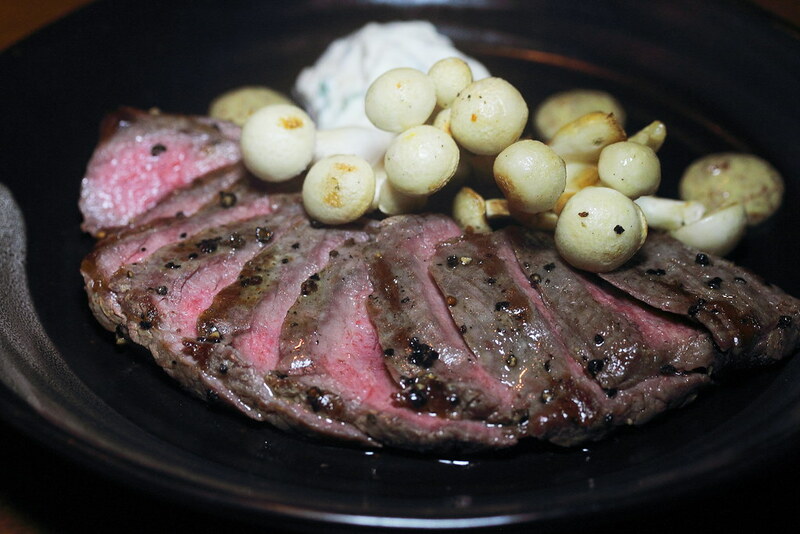 To be frank, after a series of vegetables and fruit dishes, I was delighted to have the charcoal grilled Flank Steak ($29). Grilled to perfection with a reddish interior, the beautiful piece of cut comes with a nice texture bite. Do remember to save your stomach for the Strawberries and Cream ($12). This is perfect to wrap up the evening with the yummy bowl of strawberry, cream (creme fraiche), house made sorbet and grated chocolate. 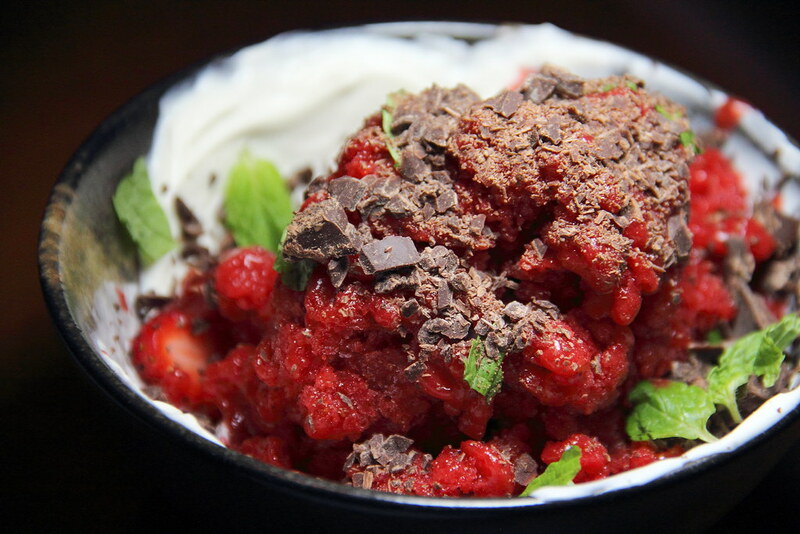 The used of cream fraiche and grated chocolate helps to balance the sourish of the sorbet. I guaranteed you, you probably do not wish to share it with anyone. 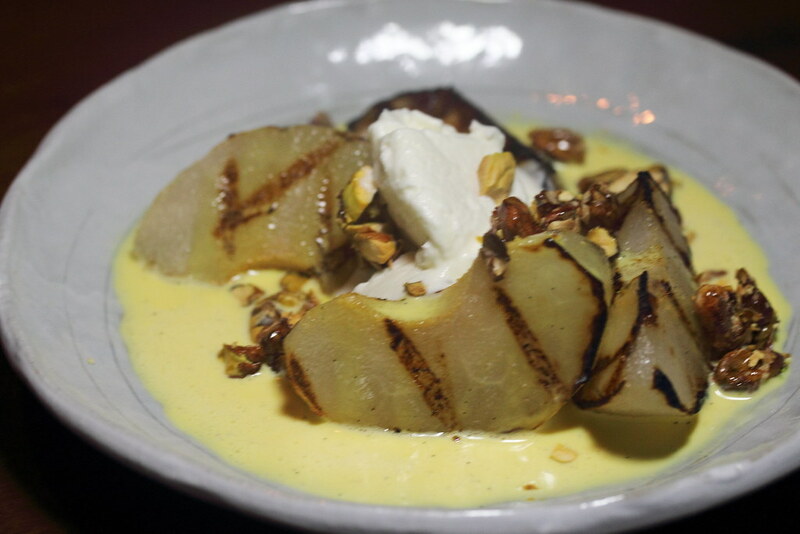 Once again Moosehead Kitchen-Bar has impressed me with their new creations. I really find them smart in the sense of using the simplest ingredients to create it into such a modern and delicious dishes. Even vegetarian will be delight with their latest creations such as the roasted cauliflower, roasted carrots, roasted beetroot, shredded cabbage and seared watermelon.